PT (Persero) Perusahaan Penerbangan Garuda Indonesia, also known as Garuda Indonesia, is the national airline carrier of the Republic of Indonesia. The word "Garuda" itself actually derived from a mythical bird and according to Indian Vedic tradition, Garuda is the carrier of the Hindu god Vishnu. The airline company is wholly owned by the Indonesian government and together with its subsidiaries, operates well over 100 aircrafts and carry 10 million passengers annually. With a full service oriented airline, Garuda Indonesia's class configuration is divided into first (Boeing 747-400s), executive (business), and economy classes. However, it lacks certain modern products which can be found on other international airlines such as personal TV screens attached at the back of the seat for leisure viewing the seats on both business and first class cannot convert into beds. There is a 24-hour call center available for local customer services. With the launch of the e-ticketing system (paperless or electronic ticket), tickets will be computerised and no need for traditional paper for all domestic flights and flights to Singapore departure from Jakarta. 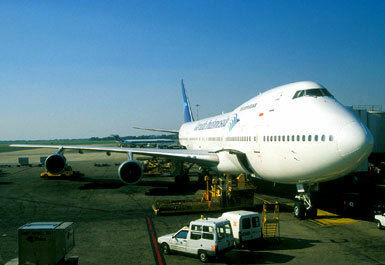 Garuda has always been the remarkable driving force behind Indonesia's tourism industry. The company has provided an efficient access to all parts of the Indonesias archipelago for its foreign overseas markets. It's sister company is called Aerowisata and Garuda Citilink, providing extensive domestic flights within Indonesia. At present, Garuda has flights operating to as many as 45 destinations (21 domestic, 24 international) around East and South East Asia, Australia and the Middle East. The important tourism markets include both Australia and Japan. Thus, Garuda Indonesia's new extended route map extends as far as Western Europe. Garuda Indonesia relaunched its frequent flyer program, The Garuda Frequent Flyer (GFF) with a new look and feel in the year 2005. This move has also introduced new benefits, and new services and the new program also has now allowed members to earn miles on domestic and international flights. The membership tiers includes Blue, Silver, Gold, and Platinum benefit levels.